If you are reading this article, on this website, you are already craving something more than a run-of-the-mill training experience. Being different is a good thing, but that is often one of the hardest things to convince people when they start training. There’s an interesting assumption that what everyone else is doing is right – the fallacy of the ‘authority of the many’, or the bandwagon fallacy. Where health and fitness are concerned, the many are evidently not right. How many people do you know who are happy with the way they look, feel and perform? Now think about how many people you know who go to the gym three times a week but are still overweight, stressed, tired and fighting an ever-losing battle with their aging bodies. It takes a lot of bravery to stand out and do something different in an environment that is as exposed as a gym. For example, to be the only female in the gym doing weights, when all the other women are on the treadmills or in the yoga studio. Wouldn’t it just be easier to do what the other girls are doing, and hide in the crowd instead of presenting yourself as a piñata to be knocked down by the first jerk who opens his mouth? To stand out from the crowd, to get exceptional results for your efforts, you need to be the sort of person who knows what they want and goes out of their way to get it, even if it means doing something different from what everyone else is doing. You seek out people who can help you, people who know what they are talking about and can demonstrate this. You take the road less travelled. This takes bravery and commitment. But the rewards are great. When I started this blog several years ago, I was one of only a handful of women worldwide who wrote about proper weight training. People who found my website were ecstatic to find another iron enthusiast of this gender. But what amazed me was the number of women scattered around the planet even doing this stuff on their own. Each pioneers in their own right. We’d all had similar issues: fear of what others would think, fear of looking stupid, of doing it wrong. Fear of being ridiculed or preyed upon by men, or just intimidated into going away and never coming back. But individually we had all overcome these issues just by wanting it enough. And being the sort of people who don’t back down just because something is a bit difficult or out of the ordinary. After some 12 years of going to the gym and learning it all the hard way, I finally became a full time trainer not long ago. You’d think this would make me pretty full of myself but actually I have found it a humbling experience. It has brought me into contact with so many people who – against greater odds than I ever had to face – are pursuing their path to strength and health with courage and purpose. So this post is by way of celebration of all those people – women and men – who just get on and do it and aren’t afraid to be different. I am very excited when you drop by the website to add your thoughts. I’m always learning new things from you and am continually inspired by your independence, energy and dedication. The funny thing is that many don’t realise just how different they are, how much they stand out. 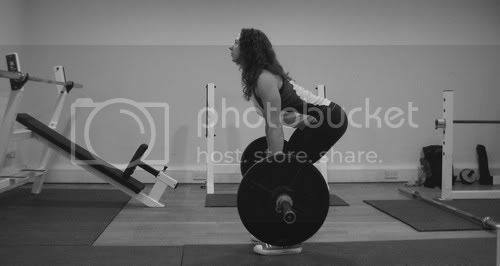 Today I was training a woman who has pulled 105kg, and was attempting 110kg, which she failed on – had a rough and busy week. Sometimes it’s good to realise how remarkable you are. Thank you for writing this post. I am new to weights and im the only girl in that section of my gym. But knowing that i am doing the excercises that i want to do and am not following the crowd makes me feel ten times better about my workouts. Reading this lets me know that im not the only one that feels like this and as long as i continue to strive to be the best i can being the only girl will seem like an achievement and a motivator for others to come and join me. How fun that I found your site! I’m always looking for sisters in iron. Love this post and agree with it all. Our next step is to convince weight-lifting women that they don’t have to be powerlifters or deadlift 300 lbs to get wicked results in the weight room. @ Kyle: I agree, both points of view are healthy(comparing self with self but also looking around sometimes and being proud of what you have achieved). @LaToya: Keep at it! Great attitude. @ Suzanne: yep agree, lifting weights can just be a very effective means to an end. Your blog looks great, by the way! I love the term “brave” as applied to the being-there, and not just the workout. I wrote about this myself several years ago, ironically, in the context of a female athlete I was training. My observation training through the years is this: That (serious) women have a MUCH greater propensity to be brave in the throws of it than men. I have trained exclusively with female partners for nearly 20 years, because they challenge me more. I have not seen this site until today. I am thrilled, and will probably spend too much of the evening reading past posts. Very nice! Sally thanks for writing this post and thanks for reaching out to like minded women all over the world -for doing things like holding that webinar on Strength Training and having a Network.In a world where Sheep mentality dominates in the field of Health and Fitness it is important not only to practice Strength Training but to speak up with Passion and Knowledge and to keep Spreading the Light.My Regards and Best Wishes !! @emergefit: Thank you for your kind words! You always inspire me to work harder Sally. Yes its tough and different being a woman and only being a light weight but its relative. Everyone wants to see the heavy weights but you have to challenge yourself on body weight percentages. Keep up the good work…I always enjoy reading your posts. Great site Sally, found it after reading Never Let Go and looking for more on Dan John. Just to let you know that the site’s ‘contact@’ email address is sending a mailbox full message. i’m 36 and have been doing martial arts for a couple of years but decided this year to add in strength training. i do yoga for flexibility and balance and the muay thai helps with speed, power, cardio, reflexes, etc., and is just plain FUN but i knew i was lacking in strength. so i found a small local gym where you get (council subsidised) personal training for a fiver (!!!) and so last week i booked a session with this wonderful man who’s devised me a stregth programme. it was so satisfying to finally get over the intimidation and try weightlifting, even if i could only manage the bar! hahahaha! my aim is to start strength training twice a week and see where that takes me. i feel really excited and positive about it and reading all your excellent posts is so encouraging. thank you! Thank you, good luck in your strength training, hopefully you will love it. Strength and power training is very useful for martial artists – we have a few who come down to our weightlifting club and they have all said that the training has improved their fighting. I must admit, I am pretty nervous about using the barbells with (reasonably) heavy weight in the gym at the moment. This is mainly because the free weights section of my gym is small and always seems really busy (i.e. full of blokes!). The culture there is that women use the machines and the small dumbbells in the “friendly” area, if they use weights at all. Or they go to Body Pump. I’ve decided that these blokes can stick it if they’ve got issues with me being in “their area”. It is my dream to get strong (and to be able to hold my own!!) and, although I’m not lifting small weight (I’m using mid-weight dumbbells) I know that I need to just do it. I guess it’s just the fear of failing in front of a load of blokes who can shoulder press what I’m using to squat! Thank you for writing things like this post. It’s the kick in the arse I need! !